Everyone in my family is now old enough to have a mobile phone, which makes our house’s landline nearly superfluous. The only remaining hurdle is our alarm system, which is monitored by a third-party company. We inherited the control panel and remote sensors when we moved in 15 years ago. But security technology has improved—alarms can now notify monitoring companies through a cellular rather than landline connection, and the systems are much easier to manage and operate. 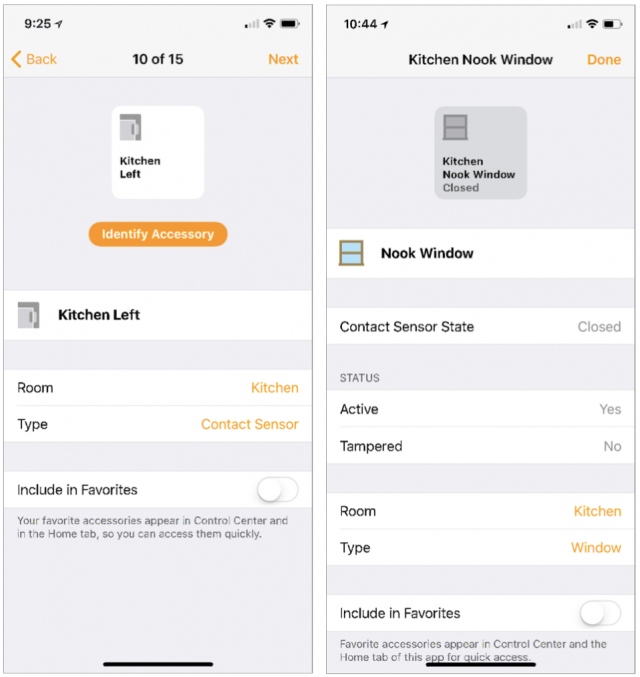 Over the past few years, we’ve also been gradually adding HomeKit accessories. We now have a few switches, a door lock, smoke and carbon monoxide alarms, a couple of thermostats, a garage door opener, and a HomePod that all work with HomeKit. So my interest was piqued when Honeywell announced support for HomeKit in its Lyric Security and Home Control System. If Honeywell did HomeKit right it would make our alarm system much more capable and easier to use. At the heart of the Lyric Security and Home Control System is the Lyric Controller, a full-featured security panel that has just about every bell and whistle you can think of. In addition to arming and disarming the alarm, you can use the Lyric Controller to control Lyric-compatible thermostats, cameras, lights, and locks with its touchscreen, an app, or your voice. 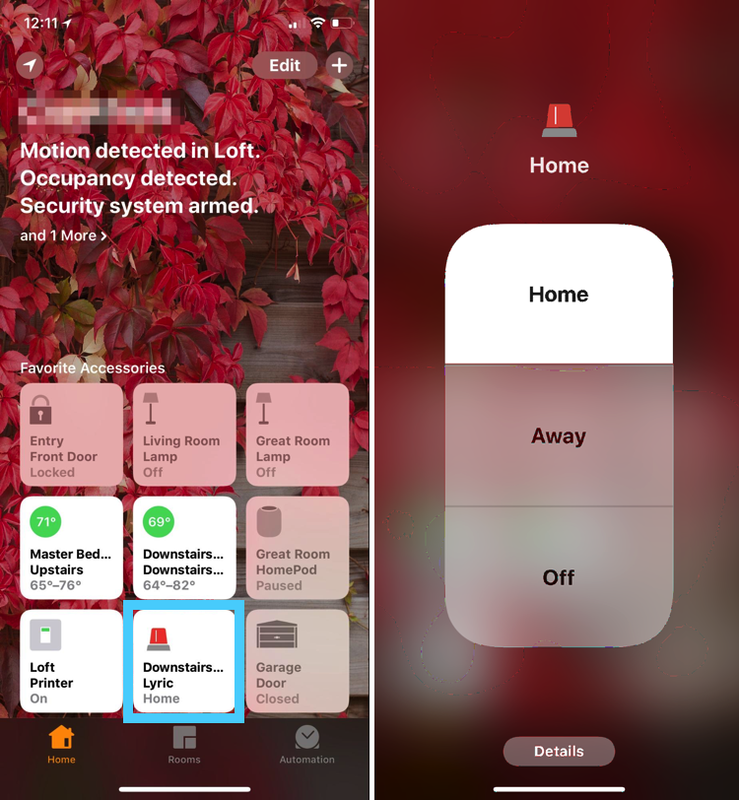 Just as HomeKit has scenes, you can create Smart Scenes on the Lyric Controller that can execute several actions at once, such as arming the security system, turning off the lights, locking the doors, and setting the thermostats. You can add dozens of users, each with their own access code. You can specify a variety of chimes when different doors are opened. The Lyric Controller can even exclude certain devices from the alarm system—for instance, you could leave a sensor-monitored upstairs window open, but still enable the alarm while you are out. 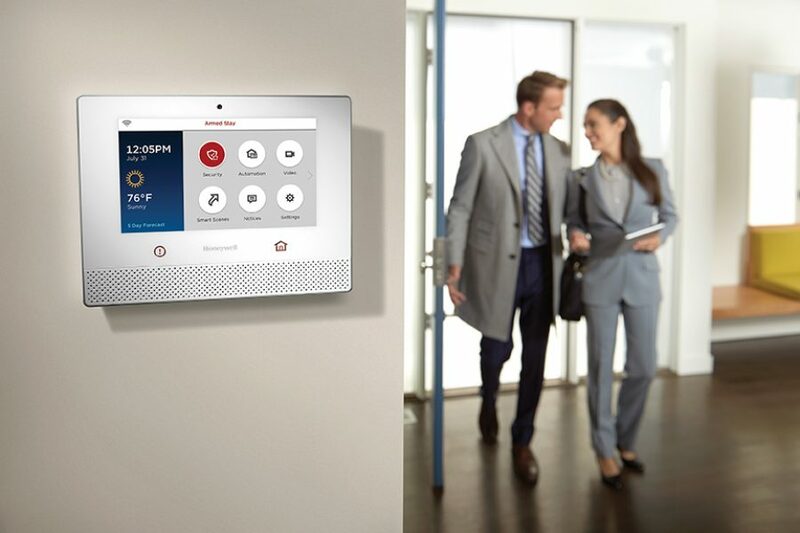 Because Honeywell’s Lyric system is meant to be a professionally installed and monitored security solution, it is not a do-it-yourself home alarm system. On Honeywell’s Web site, I was able to locate an alarm monitoring company in my area that would replace our current alarm system with new hardware and set up the Lyric Controller. After roughly a two-week wait for all the system parts to arrive, the installer spent all day programming the Lyric Controller to communicate with the satellite devices and installing them. He added the Lyric Controller to my Wi-Fi network and tested the cellular connection from the controller to the alarm monitoring office. He also installed three door sensors, eight window sensors, a motion detector, two glass break detectors, a pair of smoke alarms, a siren, and a key fob. That may sound like a lot, but the Lyric Controller can handle more than 100 satellite devices. Happily, the installer left me with the task of getting the Lyric Controller up and running with HomeKit. Here’s where we hit our first speed bump—the Lyric Controller arrived without the firmware necessary (version 1.04 or later) for HomeKit support. That was like unboxing a new Mac and learning that it needed an update to the latest version of macOS. By pressing a button in the Tools area of the Lyric Controller—protected by an installer password—you can download and install firmware updates. I could probably have done this myself, but my alarm monitoring company wanted to send a technician to my house to handle it at no extra cost. After a few minutes time to download and reboot the Lyric Controller, the firmware had been updated to 1.04.07178.491. Another way to tell if your Lyric Controller is HomeKit-capable is the presence of a Reset HomeKit button in Tools > Advanced, which is accessible after entering the master password (which is different from the installer password). 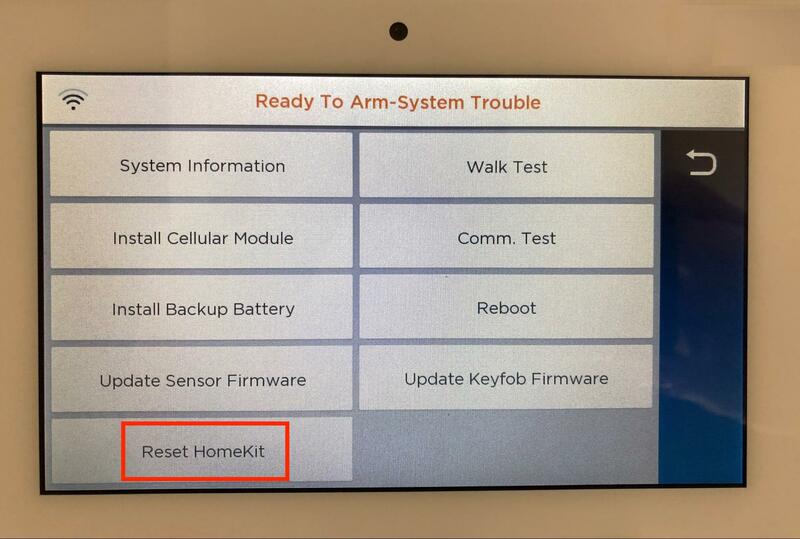 The process to add the Lyric Controller as a HomeKit accessory was relatively easy, beginning with the Add Accessory step outlined in “A Prairie HomeKit Companion: Setting Up Accessories and Rooms” (16 January 2017) and Take Control of Apple Home Automation. You add most HomeKit accessories by scanning or entering a setup code that appears on either the accessory’s box, in its manual, or on the accessory itself. On the Lyric Controller, enter the master code (which is in its documentation) and the HomeKit setup code appears on its screen. Tap Enter Code on the iPhone and key in the HomeKit setup code. After adding the Lyric Controller, the Home app displayed all the Lyric sensors as HomeKit accessories. That’s because the Lyric Controller automatically acts as a bridge for those devices. Here are the before and after details of a sensor on one of our kitchen windows. On the left are the details about the window sensor, originally named “Kitchen Left” by our installer. On the right are the details after I renamed it Nook Window and changed its type from Contact Sensor to Window. It’s much more descriptive and the window icon makes more sense—and changes to indicate when the window is open. From within the Home app, a press on the Lyric Controller’s accessory button exposes three options for the alarm: Home, Away, and Off—along with a Details button. A tap on the Details button provides the usual HomeKit options, including the settings for status and notifications. Here’s one example of how HomeKit makes it easier to use our alarm system. With our old alarm system, if we tried to set the alarm with a window open, we’d get an audible announcement that the system was not ready to arm. Tracking down the open contact sensor was not easy because the LED screen on the panel listed only a number. It was often easier to wander around the house and check every sensor than to dig out the manual where we might be able to find a list of numbered sensors. The HomeKit approach, which shows the status of named accessories, makes this problem much easier to correct. The Home app doesn’t solve every problem. Our old alarm system couldn’t reliably tell us when the battery in a door or window sensor was dead, and although the Lyric Controller can show the battery status of all of the sensors, the Home app does not show battery status for these accessories. However, this information is visible in other third-party apps that can show details about your HomeKit devices—even those made by other manufacturers (Elgato Eve and iDevices Connected to name two—to learn more about the Elgato Eve app, see “A Prairie HomeKit Companion: The Elgato Eve Room,” 19 June 2017). Another advantage of HomeKit integration is being able to interact with the Lyric Controller with an Apple Watch. Controlling the alarm in the Home app on my Apple Watch (the original model) is fast, easy, and reliable. Tapping the button for the Lyric Controller exposes the three choices for the alarm (Home, Away, Off). A twirl of the digital crown selects the status and any change occurs immediately. With HomeKit comes support for Siri. Using Siri to control the Lyric Controller is fairly straightforward, but there are some inconsistencies. Honeywell doesn’t publish a list of specific Siri commands that can be used with the Lyric Controller as it does for the Lyric Thermostat. Honeywell tech support told me that Siri commands with the Lyric Controller are focused on the status of the alarm and arming/disarming it. After some trial and error, here’s what I found when using Siri on my iPhone, iPad, Apple Watch, and HomePod. You may discover some other words that will work. This command puts the Lyric Controller in Stay mode, where the alarm is on, but because you’re assumed to be home, the motion detectors are disabled. 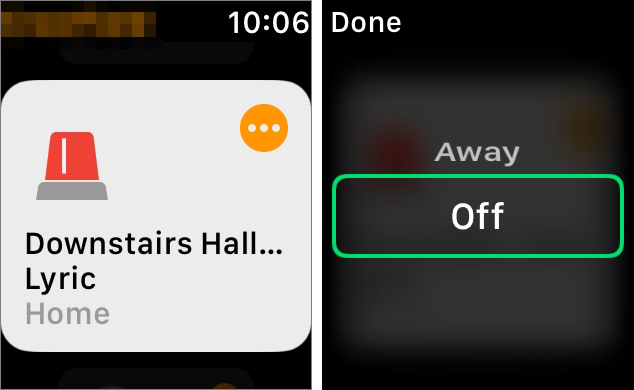 You must use the word “stay” in this command, even though both the iOS and watchOS Home apps instead use the word “home”. (See the screenshot above in the “Controlling the Lyric Controller from the Home App” section.) The phrase “Arm/Set/Turn on/Activate the Lyric to home” won’t work. It would be good if this terminology was consistent between Siri and the Home app. When you’re going out, these Siri commands put the Lyric Controller in Away mode, which arms both the alarm and the motion detectors. Interestingly, I had only occasional success using the word “set” with this second command. All the others worked every time, but “set” rarely worked, even though it works with other commands, and I have no idea why. Alarm monitoring companies have told me that the most common false positive trigger for motion detectors is a household pet. So if you have cats or dogs in the house while you’re out, it’s better to put the alarm in Stay mode (which prevents motion detectors from triggering the alarm) rather than in Away mode. Finally, as you return home, you can easily disable the security system with one of these Siri commands, which is vastly easier than typing in a security code on the panel. The disarming commands work fine when issued from an iPhone, iPad, or Apple Watch—but not from a HomePod. This is by design. HomeKit-compatible security accessories (such as alarm systems and locks) can be locked or armed—but not unlocked or disarmed—using a HomePod. This prevents a would-be burglar from standing outside a window and shouting an unlock command that the HomePod’s sensitive microphones might be able to pick up. Another thing to keep in mind: the word “alarm” means something specific to the HomePod—namely, a clock-based alarm. So if you’re getting ready to leave your house with an armful of stuff, saying “Hey Siri, turn on the alarm” won’t work, but “Hey Siri, turn on the Lyric alarm” engages the alarm in Away mode. You can also create a scene that includes setting the Lyric alarm for Stay or Away and then invokes that scene with Siri. Speaking of scenes, I edited my HomeKit Good Night scene to turn off the lights downstairs, lock the front door, and set the Lyric alarm to Stay mode. It worked beautifully with the Home app in iOS and on the Apple Watch, and Siri handled it without a problem. The scene worked correctly even if the Lyric Controller was already set for stay and the front door was already locked. You can ask Siri about the status of the alarm (“Hey Siri, is the Lyric on/armed?”; “Hey Siri, what’s the status of the Lyric?”). Siri can control individual HomeKit devices. In contrast, controlling individual devices with the Lyric Controller’s voice commands requires that they are included as part of one of the Lyric Controller’s Smart Scenes. You can use Siri with a HomeKit hub like an Apple TV, iPad, or HomePod to control HomeKit devices while away from home. In contrast, the Lyric Controller can only hear commands spoken in a normal voice from about 10 feet away, and background noise can be a problem. 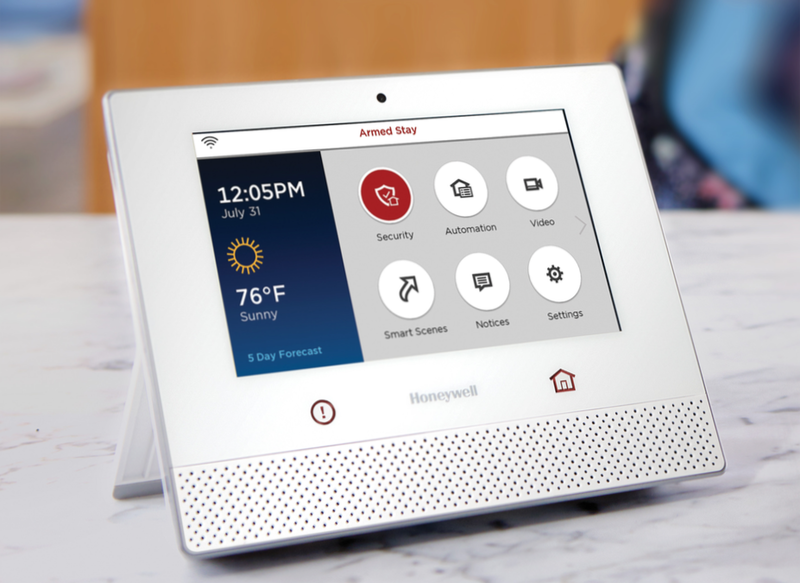 Like other companies that sell HomeKit-enabled accessories, Honeywell offers its own app—Total Connect 2.0—for the Lyric Security and Home Control System. As you would expect, you can arm and disarm the alarm using Total Connect. The app also has a long list of notifications it can provide, but many of them duplicate the notifications that Apple’s Home app will send. Total Connect does offer some additional detail that we can access if we need it. For example, Apple’s Home app will notify us when the alarm is armed or disarmed. Total Connect displays who has armed or disarmed the alarm based on the access code entered on the Lyric Controller. Plus, the Lyric Controller also has a camera that takes a picture of the person who arms or disarms the alarm, and these images are viewable in the Total Connect app. We wanted to keep our HomeKit setup as simple as possible and use Apple’s Home app to control our devices and send us notifications. So we disabled most of Total Connect’s notifications. Alarms are meant to serve as a deterrent to potential burglars while also providing peace of mind to homeowners. There’s something soothing about being able to know the answer to the question “Did you set the alarm?”, whether you’ve asked it upstairs just before bedtime or 500 miles from home—and employ the Home app or Siri to do something about it if need be. The Lyric Controller has been rock solid and does everything I hoped it would. It works well with HomeKit and provides capabilities that go well beyond those of our last-century alarm system. It’s a keeper. And about that landline? It’s gone. Welcome to the 21st century.